Bruges (Belgium) (AFP) - One newspaper headline described Thierry Henry as “cursed” in the wake of his managerial bow with Monaco, and the France great will be desperate to put that behind him in Wednesday’s Champions League encounter with Club Brugge. 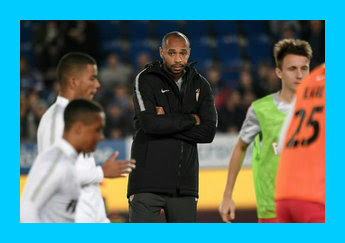 Henry’s long-awaited first game as a coach in his own right ended in a 2-1 defeat at Strasbourg on Saturday, with Monaco’s night marred by goalkeeping errors, a sending-off and injuries. The headline in question appeared in the following day’s edition of sports daily L’Equipe, and that game certainly made it clear to the 41-year-old that he has a massive job on his hands. “I was aware that it would be hard to put something in place after just two days of work,” said Henry at the weekend, having had limited time on the training ground since taking over. Defeats against Atletico Madrid and Borussia Dortmund mean Monaco remain pointless in Europe, and Wednesday’s match against the Belgian champions offers both sides a last chance to keep their hopes alive in the group. More realistically, these teams are now fighting it out for third place and a berth in the Europa League knockout rounds. They meet again at the Stade Louis II on November 6. “We need to take the positives. The team is starting from zero,” insisted Belgian midfielder Youri Tielemans, but there were not a lot of positives from Henry’s debut. It was a terrible start for France’s all-time leading goal-scorer, but now he is hoping to lead Monaco to a first win in 11 Champions League outings. The circumstances are daunting, but Henry – who won the Champions League as a player with Barcelona – knew what he was signing up for at Monaco, having turned down the Bordeaux job at the start of this season. “It is different because now he is the one making all the decisions, but he has a philosophy that I think can help us start winning matches,” said Nacer Chadli, who has worked with Henry in the Belgium set-up. Whether that will be the case on Wednesday remains to be seen, with last season’s star player Rony Lopes still absent and Falcao a doubt. Meanwhile, with Sy not in Monaco’s Champions League squad, it looks like the 20-year-old Loic Badiashile, who usually plays in the French fourth tier for Monaco’s reserves, will start in goal at the Jan Breydelstadion.